So, you’ve decided to bring greenery into your home and take the leap into plant parenthood! Don’t worry, it’s not as scary as it sounds. The key to entering the indoor houseplant world is getting the right plant for you and your space. Think of adding a new plant to your space like a mash-up between home improvement and bringing home a new pet — or decorating with a touch of responsibility! When you’re ready to make your way to the plant store, here are some useful guidelines and considerations based on years of experience in my shop helping dozens of people every day choose and care for houseplants in the Pacific Northwest. Although it may seem like a good idea to do some quick googling before you hit the plant store, I encourage you to go into your shopping experience without having already decided what plant you’re going to get. And whatever you do, do not google “plants that are good for my air” or “beginner houseplants” or “air purifying plants,” etc. These searches will inevitably lead you to a fluff article or infographic stemming from the NASA air purifiers list. Not to knock NASA or any of the plants featured on this list (they are all fine plants, and may even end up being a plant you love), but walking into a plant store and requesting an aloe or a palm because you picked it off a generic list will severely limit your options and may set you up for failure. All plants make oxygen and absorb carbon dioxide, so any plant is a good choice for air quality. It’s much more important to find a plant that you love and one that will thrive in your environment and under your preferred care routine than to worry about oxygen output. Instead of googling what plants are best for air, spend some time looking at photos of plants or homes styled with plants and get a sense of the general qualities you like the look of best. Do you like tall plants? Do you like sleek slender plants, chunky succulents, sassy cactus, trailing plants, plants with huge glossy leaves, or maybe bushy beauties? When you’re ready to buy, being armed with the knowledge that you have a thing for dainty blooms and fuzzy stems will help you find just the right plant — but do keep an open mind! The best way to find your perfect plant is to buy it from someone who loves indoor plants! Go to a few plant shops in person and listen to the advice the staff gives you or other customers in the store. Do they know the names of the plants? Do they ask questions about the environment or what style of plant you’re looking for? Do the plants in the shop look healthy? If you’ve never purchased a houseplant before, look for a shop that specializes in indoor plants only. Stay away from department stores and don’t buy your first plant online! While many online retailers have gotten very good at shipping plants effectively, if this is your first time, it’s better not to take on the trauma a plant goes through in the mail on your first go. Buy that fancy specimen from your favorite Instagrammer once you’ve gotten the hang of caring for a few healthy plants first. Nurseries that have both outdoor and indoor plants are likely to be very well versed in outdoor gardening, which is definitely better than having no houseplant experience at all, but choosing and caring for a tropical plant indoors is different enough from outdoor gardening that their houseplant care advice may be canned or extrapolated largely from their outdoor knowledge — they’re just not the same. A good indoor plant specialist will be able to help you shop based on your available lighting, desired size and style, and the care routine you’re willing to apply to your plant. No matter which combination of these traits you have or want, they should be able to offer you a few options to choose between. Once you’ve found a shop you love that has the expertise to help you, come ready with a few pieces of information that will help your shopping experience. 1. Pick a spot (or two… or several) in your house that you want to put a plant in! Choose somewhere that gets as much indirect light as possible. This means the space is brightened by natural light in the middle of the day but isn’t in the direct path of the sun (like that bright patch on the rug the cat likes to nap on), has little to no draft, and is in an area of your home you spend time in often. This type of lighting will give you the most options for interesting beginner-level plants. If you don’t have this kind of lighting, just take note of the closest version you have! Avoid places like on top of tall bookshelves or in spare bedrooms where it won't be easily accessible. Once you’ve got the hang of your first plant or two, you can spread out to these harder-to-reach spaces. 2. Choose a size and style of plant you want in that space. I highly recommend starting off with a plant in a 6” pot or larger if possible. It may seem intimidating to start with a larger plant over a cute tiny one you can keep on your windowsill, but trust me, a larger plant is going to be much more resilient and will have the gusto to make it through your learning curve. Those little baby plants just don’t have what it takes to withstand any trial and error while you learn to care for it. This is where your style research from before comes into play. It’s helpful if you know if you want something tall, short, narrow, bushy, etc. so you can identify plants that you’ll click with and will also fit your care-taking style. 3. Note where the windows are in this space. A good houseplant specialist should be able to tell you what kind of lighting you have and which plants will do best for you in that space when you can tell them if you have morning or evening light (better if you know if it’s north-, east-, south-, or west-facing), if the windows are small or large, and if there are trees or buildings obstructing them. If you’re not sure, snap a picture; your plant specialist may be able to identify that for you! 4. Decide how often you want to take care of your plant. Once a week? Every 2 weeks? Do you travel a lot? Want something to nurture every day? This information will allow your plant specialist to zoom in on species that will be a good fit for your care-taking style. Now that you’re ready to shop, remember that the most important part is that you find a plant you love. If you don’t love it, you’re not going to take care of it. Much like when you bring a pet home for the first time, you should get the proper tools for taking care of your plant when you start. 1. Get your plant potted. Most plants are sold in plastic nursery pots. While these are great for transporting plants and are an inexpensive and durable option for the nursery industry, they are not ideal for the long-term health of your plant. Plastic particles leach into the soil slowly over time. If kept in the liner, you’re more likely to have problems with over-watering, root rot, root binding, and soil pests. Budget in a terracotta or ceramic pot to transfer your plant into within 30 days of buying your plant. Most indoor plant stores will offer repotting, so it’s easiest to get both at the same time. A pot with a drainage hole and a tray is best if you’re new to the game (though not required once you’ve gotten the hang of watering). 2. Buy a watering can. When you water you want to evenly distribute the water across the soil so it absorbs properly. Avoid the temptation of dumping the last of your glass of water into your plant, which will drop straight to the bottom. Having a proper watering can will help you water more regularly and more evenly, and will help prevent watering problems. 3. Talk to your plant shop about fertilizer. All plants need some fertilizer at some point. Some very rarely, some more frequently. In my shop we use a bacterial inoculant fertilizer, which is a powder that keeps the beneficial microbe populations active in the soil and they work with the plant to make the nutrients the plant needs. Avoid fertilizers like Miracle-Gro, which kill all those microbes in the soil and require frequent regular fertilizing in order to prevent your plant from going into shock. 4. Check on your plant regularly. Most plant problems will become apparent within a few days of whatever symptom is occurring (check for yellowing, brown spots, black spots, pests, and drooping in particular). If you’re checking in regularly you can catch and attend to any problems before they become catastrophic. I recommend once a week for succulents and cacti, twice a week for tropical plants, and daily for bonsai and temperate plants. 5. Find a resource you like. Have questions about your plant after you buy? Find a business, blog, or friend who can help! At my shop we have a text support line that’s free for anyone to use. Text in photos of your plant and your questions or concerns and I or my staff will text you back with expert advice! Urban Sprouts text support line: 206-789-0710. 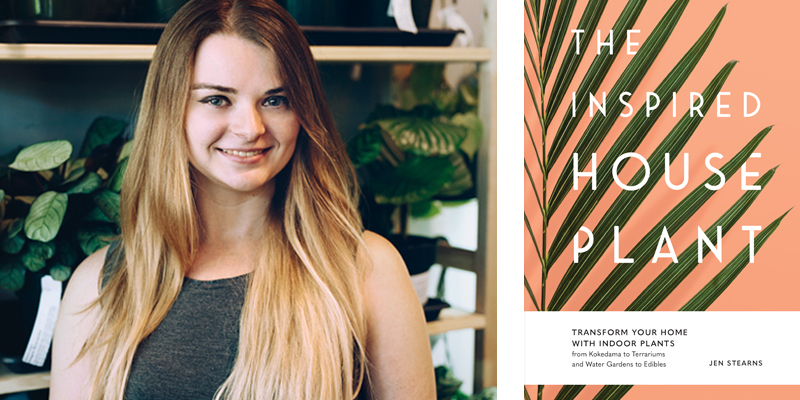 Jen Stearns is the owner of Urban Sprouts, a specialty house plant store in Renton, Washington, and author of The Inspired Houseplant. Jen has a background in urban agriculture and small business operations and has spent the last four years helping her customers learn to pick and care for indoor plants in the Pacific Northwest. She lives in Renton, Washington, with her new husband, Sam, and their bunny, Cthulhu.